First, who’s not in the National Portrait Gallery? Minorities! Honestly, even without the prompt, it would have been a slow realization that as we walked through room after room of white faces, something was missing. There was one freed slave portrayed in the audience of an abolitionist convention, and that was about it as far as paintings of minorities at the Gallery go. Second, and more broadly, working class people are not in there. This, to me, is less upsetting as it’s just a natural consequence of the fact that only the upper crust can afford to have portraits commissioned. Hours after visiting the Gallery, though, the lack of minorities still rankles, for one simple reason. If a black or Asian or Latino family came to visit the Gallery, and one of the children asked their parents “Why don’t any of these people look like us?” the parents would have no good answer. We were supposed to pick one portrait that we found particularly affecting. As a political science major who has taken British History 244, though, I could not resist going with the dueling portraits of William Ewart Gladstone and Benjamin Disraeli. Gladstone was the pillar of 19th century liberalism, while Disraeli was his counterpart on the right. Their respective portraits contain subtle and not so subtle bits of political imagery. 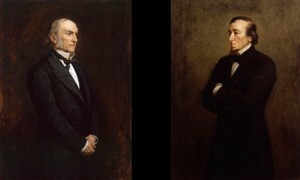 First, Gladstone is facing to his left, while Disraeli is facing his right. The rest of what follows may be a bit of armchair psychology, but I believe it speaks volumes about both men. – Gladstone has his hands folded, while Disraeli’s arms are folded in an aggressive posture. Disraeli was far more warlike as prime minister. – Gladstone is looking towards the sky, while Disraeli’s gaze is a bit more earthward. This is in line with both men’s fundamental outlooks on life: Gladstone considered himself a great Christian moralist, while Disraeli preferred to concern himself with more earthly issues, considering Gladstone to be out of touch with the nitty-gritty of the world. While the placing of these two portraits together obviously has an intended effect, that does not make the effect any less powerful. While standing in front of the two portraits, I felt like I could almost feel the hate flowing between these two great men, a great moment for a politics junkie like me. Gotta love Professor Osborne’s class!